An interesting exhibit is scheduled to be admitted into evidence, today, in the ongoing federal trial of The Coastal Corporation CEO, billionaire and oilman Oscar Wyatt: His Little Black Book. But at least one person has already seen what’s in it: Me. And I’m about to tell you the contents, which I’ve known for some time. The document dates back only a few years. 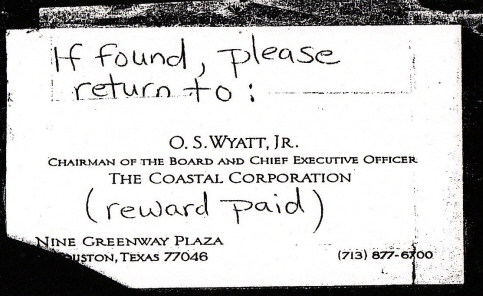 Oscar Wyatt’s address book has been the subject of much speculation and failed objections by defense attorneys in Wyatt’s ongoing trial for illegally doing business with Saddam Hussein and taking kickbacks in the oil for food scam. And since I’ve long known what was in the book, I can see why. Home phone numbers and addresses for top Saddam officials, such as Tariq Abdul Aziz (Saddam’s loyal Prime Minister and second in command) populate the book. Ditto for Abdul Al-Takriti [sic] of Saddam’s Ministry of Oil and a cousin of his (Al-Tikriti, as it is actually spelled, means “The Tikriti” or from Tikrit, Saddam Hussein’s hometown). Saad Al-Takriti [sic], another Saddam cousin and top Oil Ministry official, is also listed. Saddam’s U.N. Ambassador, Nizar Hamdoon, has all of his home and business contact info prominently listed in a long entry in the Wyatt address book. Gen. Amir Rashid, Saddam’s Minister of Oil, is in the book. Then, there is Saib B. Majid, the contracts manager and consulting engineer of Saddam’s Ministry of Oil. And there are many other top Iraqi oil officials listed. There is also a Saddam Hassein listed, though it’s not clear if it’s a typo and, indeed, the guy now rotting in hell, or just another Ba’athist Iraqi with a similar name. Just as troubling are the many addresses and home phone numbers of top Iranian officials, including H. Ghanimi Fard, Director of International Affairs for the National Iranian Oil Company in Tehran, S. M. Hosseini, Director of Exploration for the same company, and Dr. A. Honardoost, also of Tehran. That hints that Oscar Wyatt was also doing business with Khomeini’s Iran and post-Khomeini Iran–both in apparent violation of the Iranian embargo. And then there are the Libyans listed. Top guys like Musa El-Arbi and Dr. Ahmed A. Frejani, both with Tripoli, Libya business addresses and phone numbers. It sure looks like Wyatt was violating our then-embargo on doing biz with Libya. Notable in the book are entries for Mohammed Saidji and Carlos “Catalina” Miguel, both of Switzerland, with whom Wyatt allegedly deposited millions into a Jordanian National Bank account in Amman controlled by Saddam, as a “surcharge” paid in the Iraqi oil-for-food scam. Very disturbing to me is the presence of the name Richard L. Crocker, U.S. Customs Service, at a Sterling, Virginia address. A 24-hour number is listed for him. Why did Wyatt need a contact on-call 24 hours a day from the then-U.S. Customs Service? Was he trying to get something into the country or out of it that he shouldn’t have been? I’m told that Mr. Crocker is now the Immigration and Customs Enforcement (ICE) Assistant Special Agent in Charge for Memphis. He worked at the U.S. Customs Service headquarters in 1999 and 2001. At the time of the listing, Sterling, VA was the location of a U.S. Customs Service Resident Agent in Charge office. It is now the location of the Washington, DC Customs Special Agent in Charge office for ICE, and ICE’s Cyber Crimes Section is located there, too. Then, there is the presence of Sheikh Khalid Bin Mahfouz in the Oscar Wyatt directory. Bin Mahfouz, a top Saudi financier accused of funding Al-Qaeda, has silenced and obtained questionable retractions from many writers regarding what is well-documented involvement in a suspicious chain of money, including his Muwafaq Foundation, which the Treasury Department designated as an Al-Qaeda front. Bin Mahfouz has been cited as part of the “Golden Chain”–the Al-Qaeda finance network–and was part of the scandal-ridden BCCI. He was once married to and then divorced from Osama Bin Laden’s sister. Despite this, he repeatedly denies the claim and has obtained fraudulent retractions from the Wall Street Journal and others on this. And he sued noted author and terrorism-financing expert Rachel Ehrenfeld, trying to silence her book in Britain, since he could not get away with doing so here. She turned the tables on him and sued him here. What was Oscar Wyatt doing with him? Was he paying off Al-Qaeda? Would love to know the details of those deals. * The Honorable Edward M. Kennedy and his nephew, the Honorable Patrick J. Kennedy, are the only Members of the Senate and Congress in the book. Did they know about Wyatt’s illegal dealings with Saddam? Did they help facilitate it? We don’t know for sure, but it’s suspicious . . . especially since their direct phone numbers, and home addresses and phone numbers are listed. Even Ted Kennedy’s many paramours–like the waitress en flagrante delicto on the floor of La Brasserie–don’t get that kind of information. Illegally dealing with Saddam apparently has more cache than pillow talk at Club Ted. * The Rev. Jesse Jackson and his Rainbow PUSH Coalition made the book. And strangely, in addition to Jackson’s “Business” number, “Business Fax” number, and “Home” telephone number, there is a phone number listed as “Other.” Is it the number of his extramarital girlfriend with whom he fathered an illegitimate kid and to whom the Rainbow PUSH Coalition made illegal, fraudulent pay-offs? Don’t bet against it. * ABC celebrity interviewer and “The View” Hostess Barbara Walters and her home address and phone number are in the Wyatt book. Other than a Kuwaiti journalist’s contact info, she is the only other “journalist” so noted. Why? Did Ms. Walters know about Mr. Wyatt’s illegal dealings? Clearly, with her home contact info, Mr. Wyatt knew her on far more than a professional, journalistic basis. Her close friendships with a lot of her potential interview subjects is troubling. * Marc Rich–Remember him? That was Bill Clinton’s fugitive friend, pardoned from millions in federal tax evasion, while he lived the high life and went skiing in Switzerland. He sold oil to Iran and Iraq in violation of our embargoes. Was Oscar Wyatt consulting him on how to get away with the same? Sure seems like it. Rich’s Swiss mansion is listed, complete with phone number. 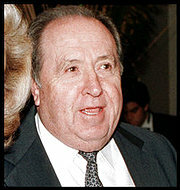 Others in the book: Henry Kissinger, Adnan Khashoggi (listed under Khasoggi), Sarah Ferguson, Duchess of York, Mrs. Pat Buckley (wife of William F.), designer Bill Blass, former Senators Lloyd Bentsen and Bob Dole, former Texas Gov. Ann Richards, James Schlesinger, Clark Clifford, media exec Barry Diller, Edsel Ford, Roger Smith, Robert Strauss, defense attorney Brendan Sullivan, Steve Forbes, H. Ross Perot, T. Boone Pickens, members of the Niarchos Greek shipping magnate family, and famed heart surgeon, Dr. Michael E. DeBakey. Nigerian Scams c/o U.S. Secret Service Financial Crimes Division. Just watch Wyatt’s attorneys use this in his defense, claiming that his illegal trade with Iraq, Iran, and Libya (and probably Al-Qaeda, too) was okay because he was “helping the government.” I called it, first. He has moved permanently to Arizona. If we need hunting licenses, he has a son and daughter who live in Colorado. Call him and he will let his son/daughter know we need licenses. Hopefully, after the trial, Oscar Wyatt won’t be in a place where he’ll be needing a hunting license anytime soon. Is there a PATRIOT left in these United States? Those in power seem to think that personal agendas (accumulating wealth and more power) are more important than the continuation of the republic. Another huge story broken for DS. I’m very curious as to whether we’ll see this on FOX (attributed or not), since the Prince is on the list. My question: will prosecutors have the balls to get Wyatt to spill the beans, or will all those powerful voices in his book make sure that the people don’t press too hard. Mukassey would be the perfect AG to work on this case, as he was the judge in the successful prosecution of the blind sheikh in the 1993 WTC bombing. Would Ted Kennedy refuse to confirm Mukassey, or would he make him promise not to pursue the case too hard in exchange for confirmation. There might be some ambitious assistant AG out there who, like Rudy back in the 1980’s, will make his or her reputation on a high profile case like this. “Very disturbing to me is the presence of the name Richard L. Crocker, U.S. Customs Service, at a Sterling, Virginia address. A 24-hour number is listed for him. Why did Wyatt need a contact on-call 24 hours a day from the then-U.S. Customs Service? Was he trying to get something into the country or out of it that he shouldn’t have been? While I can understand your concern, please be aware that, first of all, ICE agents are ON CALL, by policy, 24 hours a day, 7 days a week, 365 days a year; we are issued cell phones and granted home to work priviliges with a G-ride(that’s why we get paid 25% LEAP pay). Therefore, many ICE agents list either their direct mobile numbers, but, more often, our 24 hours communications center phone number in central Florida, which can patch people through to us as necessary to conduct the government’s business. It would not be surprising that, as a high-level legacy Customs (now ICE) Special Agent, Mr. Crocker may have encountered Mr. Wyatt in passing at some function in D.C. and handed him a business card, thinking nothing of it; heck, I do it all the time – nothing like cultivating potential sources to fight crime, you know. That said, unless there is nefarious other evidence linking Mr. Crocker and Mr. Wyatt (like wire transfers into Mr. Crocker’s bank account from Mr. Wyatt or recorded phone conversations intimating conspiracy to commit a crime), I’m not sure this, by itself, lends itself to any undue suspicion. I like Debbie and her tenacious quest to expose the worldwide jihad against the “infidels”. In this case, she seems to be assuming guilt by association. Certainly the names in a suspect’s phone book are of interest but that does not mean that they are involved in a conspiracy with the evil doer. Let’s get the facts before rushing to judgement lest we lose credibility like the infamous “Rev” Jackson. While that all seems circumstantial in the eyes of some, it still raises a question as to how his is the only one to show up. I’m sure that in all his dealings in DC, Wyatt met far more people in Federal LEA’s way higher on the food chain yet their names have yet to surface. I’ve given mine out only when dealing with other law enforcement agencies in an official capacity, not at high-brow cocktail parties. In addition, if I were cultivating potential sources to fight crime, it wouldn’t be CEO’s of huge corporations who are already on the radar for nefarious dealings. I agree this looks somewhat irregular. However, only an OPR/OIG inquiry is going to get to the bottom of this, and, in all fairness to Mr. Crocker, it ought to be fast and to ask the right questions to either exclude any involvement in Mr. Wyatt’s activities or if further investigation is warranted. Debbie, just wanted to pop in and wish you a G’mar Chatima Tova and Shana Tova!! May you be blessed with a sweet, happy and fruitful year ahead. If Wyatt was doing business in the middle east it is likely that Crocker interviewed him for some legit reason and that Wyatt held on to the card. Most agents put that 24 hour number on their card. I don’t think any of this means anything, at least just looking at it on the surface. What a relief to read some *real news* instead of being subjected to who’s going to knock Angelina (or Clooney) (or Luke Wilson) (or Britney) (or…) off the cover of People/Us/Star/….